iAgora is the only website created specifically for and by international people. The site brings us together over the internet so that we can make each other's lives both easier and more fun. By centralizing people and information, the site provides members with an efficient and fun way to communicate, thereby helping them to avoid certain problems related to going abroad, living abroad, and returning from abroad. Whether you go abroad to study, work, or travel, the iAgora community is always there. Imagine if you will a world without borders, a communications vehicle without language barriers, a place you will never be lost when you don't know where you are. Utopia? Maybe, but in the meantime iAgora comes close. iAgora is produced by a group of multi-cultural, globe trotting twenty-somethings from their offices in New York, Barcelona, and Melbourne; but that's the only thing fixed about it. With a global reach, including hundreds of volunteers, this online international community achieves what many of the most ambitious have only dreamed. Forget the splendid design, or the exceptional programming for a moment. This site's true leverage is its content. From the fun and informative in-house articles about everything from sports or food, travel or local customs, to the highly interactive forums and chats where the meat and potatoes of iAgora have no limits; this mecca for society will one day rest among the giants of Internet presence. Don't leave home without setting your browser start page to http://iagora.com. As stated above, hovering over the button will open the menu for these browsers. But if you have an older product, don't fret, we'll send you to the sitemap page. Just click the button. 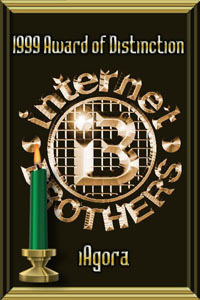 Copyright © 1997-2004 Internet Brothers and iAgora. All Rights Reserved. Really.